Ford’s new line-up of Tourneo people movers has been revealed at the Brussels Motor Show. The revised Tourneo family comprises the new Tourneo Connect as a five or seven-seater, as well as the range-topping eight/nine-seat Tourneo Custom. Available from the middle of 2018, each Tourneo has been restyled inside and out with an enhanced exterior and interior style. Sophisticated technologies and advanced powertrains have also been added, Ford says. You’ll be able to spot the Tourneo Custom by its bold new front-end design, while inside, there’s a completely revised premium cabin interior with rear seating split into six individual seats that can be arranged in conference format – a unique-in-segment feature. The largest Tourneo people mover is available to order from Ford dealers now. 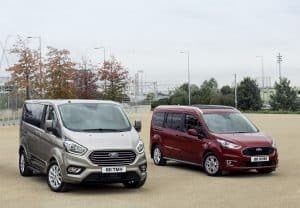 Meanwhile, the Tourneo Connect now comes with new fuel-efficient powertrains including the 1.5-litre EcoBlue diesel engine with an eight-speed automatic transmission option, and Ford’s single‑litre EcoBoost petrol engine featuring cylinder deactivation with manual vehicles coming linked to a six-speed transmission as standard. Aside from its stylish front-end, the Tourneo Connect also features upgraded interior trim materials. Hans Schep, general manager for the Tourneo family at Ford of Europe, commented: “Our fresh new range of Tourneo vehicles shows that versatile people movers can be dynamic and stylish.